This post was sponsored by Hodgson Mill through my involvement in the Healthy Aperture Network. All thoughts an opinions are my own. Thanks for supporting the brands that make this blog possible! 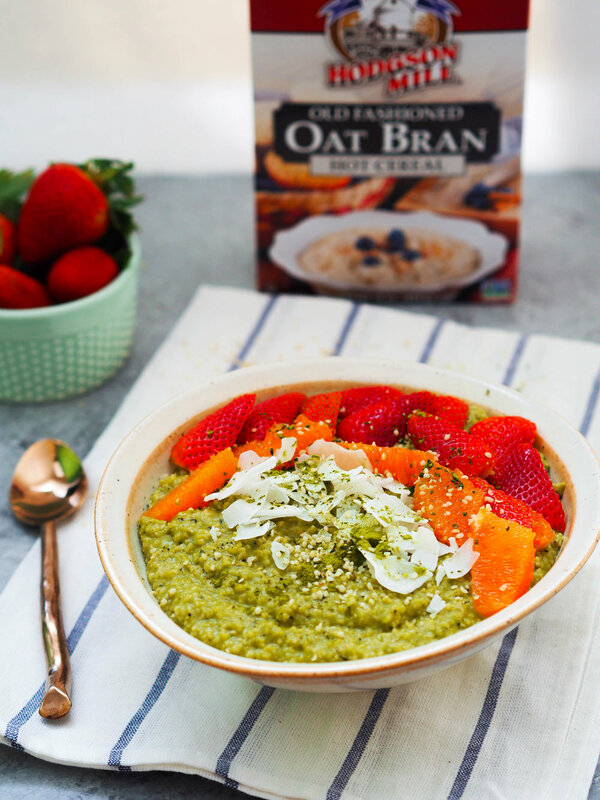 Continuing this weeks theme of meals in a bowl, I bring you this matcha coconut oat bran bowl! Let's hereby declare oat bran bowls as the new smoothie bowl. Smoothie bowls are at least one step up from smoothies in terms of filling factor, but I need something a little more stick-to-your-ribs in the morning. 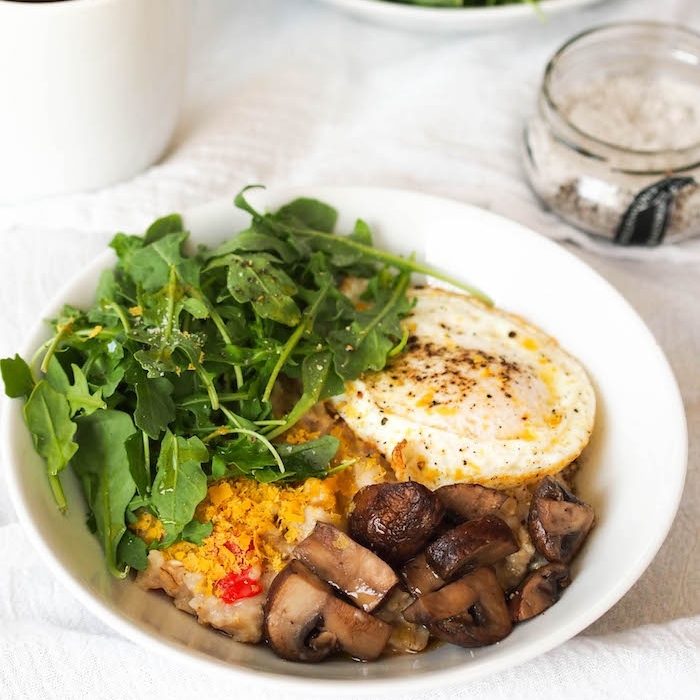 This bowl of fiber-rich oat bran simmered with coconut milk does the trick. Let's talk fiber for a moment here. Did you know there are multiple types of fiber? Soluble fibers, like psyllium, beta-glucans and gums are fibers that are soluble with water, forming a gel-like substance in the gut that helps digestion and lowers cholesterol. Insoluble fibers, like cellulose and lignan, does not dissolve in water and provides bulk to help keep you regular. Both types of fiber help keep you satisfied, by keeping food in your stomach longer. Oats and oat bran contain both types of fiber, so you get a full spectrum of health benefits. This was my first time cooking with oat bran, and I have to say, I'm slightly obsessed. Bran is the outer fibrous layer of all grains that helps protects the seed from damage. Whole grain foods contain the bran as well as the nutrient-rich germ in additional to the starchy center of the grain. Oat bran cooks in just a minute or two to yield a super creamy texture that's really comforting on a cold morning. Make a big batch all at once and heat it up later for breakfast or a snack. Look for Hodgson Mill's oat bran in the breakfast aisle, or oder online. This was also my first time cooking with matcha. I know! How have I even been a dietitian blogger without matcha? I fell in love with it when I traveled to Japan last summer, where it was in almost every sweet I ate. If you've never had matcha, it's made from specially grown and processed green tea leaves that are finely ground into a powder. Matcha has a vibrant green color and strong, herbal flavor. It's kind of expensive, but it has a unique flavor that's hard to replicate. If you don't have matcha on hand, try throwing a couple green tea bags into the water and simmer with the oats to infuse it with a lighter, but similar flavor. Heat butter in a pot on medium heat. Add oats and stir to coat with butter. Toast, stirring occasionally, 3-5 minutes until fragrant. Add coconut milk and water, vanilla, and salt and bring to a boil over medium heat. Reduce heat to a simmer and cook until creamy and thickened, about 7 minutes. Stir in maple syrup, hemp, and dissolved matcha until combined. Divide between bowls and garnish as desired with fruit and shredded coconut.